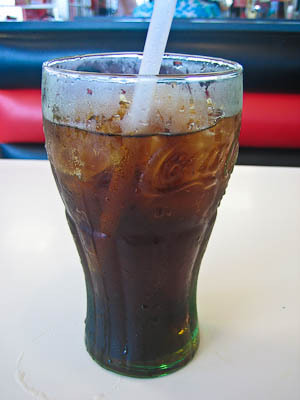 Yes, another chain, but this place gets props from Respected Burger Heavyweight George Motz of Hamburger America and the venerable burger blog A Hamburger Today, so have been wanting to try it. So out to Round Rock I went, via the shiny new 45 Tollway. 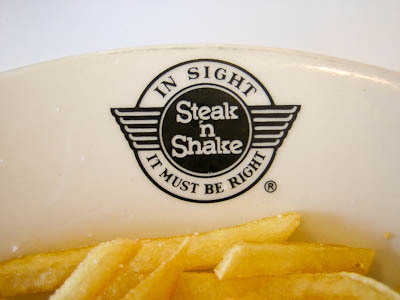 First, a little background, gleaned from the above posts and the Steak ‘n Shake website–their beef is fresh, never frozen. They have been around since 1934, based in Illinois. 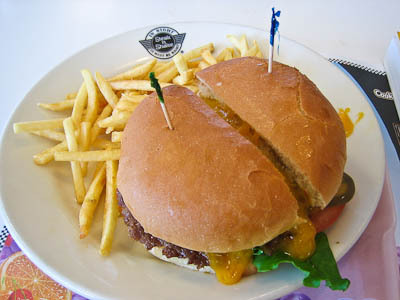 They cook the burgers on a griddle using the smash technique, resulting in razor thin patties with some crispiness to the edges. I was surprised when I walked in to see that it is a sit-down restaurant with waiters. Was expecting the typical fast food experience. Then I was double surprised to see my food served on a real plate. I mean a real porcelain plate. Not a paper-lined plastic basket, not a school-cafeteria style bakelitey plate, but an actual breakable plate. Nice touch. 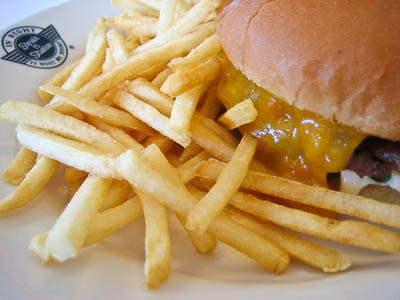 I opted for the badly-named “Cheesy Cheddar Steakburger ‘n Fries”. I had to get some clarification before ordering it because the picture and description on the menu led me to believe that the “cheddar cheese” would be that liquified type of cheese glop, the kind you see at concession stands at sporting events that is spooned out of a hot vat with a ladle. The waitress explained that they take actual grated cheddar, melt it in a cup, and then add it to the burger. Thumbs up. Burger was quite delicious for what it is. Cheese was plentiful and cheddary. Meat-to-bun ratio good. Fries were ok–frozen thin cut fries. Good for what they are, but I always prefer fresh cut fries. They were very similar to the fries at Freddy’s Steakburgers, or should I say that Freddy’s fries are very similar to Steak ‘n Shake’s…I can now see where Freddy’s got its “inspiration”. 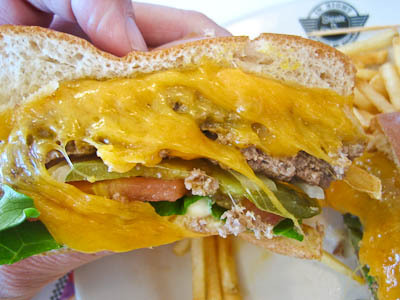 They should have also taken the cheddar idea from Steak ‘n Shake (no cheddar to be found at Freddy’s). 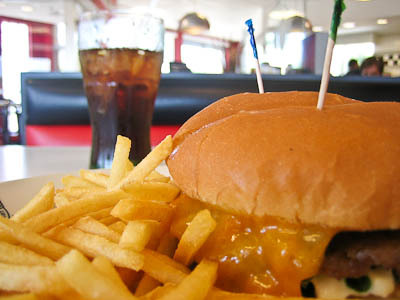 So, thumbs up to Steak ‘n Shake. 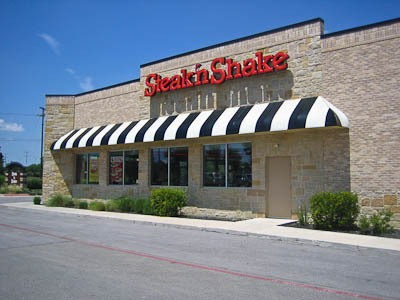 Just wish they had a location closer to central Austin. There’s one down south and one in Round Rock. Their burgers are frozen and thawed for use. Wendy’s is the “fresh, never frozen” boaster.